Hi Susan, Thank you for your review and for including a photo of the rainbow lorikeets installed in your kitchen in Scotland. They've travelled a long way! Thank you Kerrie, always a pleasure doing buisness with you - best wishes for 2019! Thank you Danny - and for sending through photos - that colour was a great choice! Thank you for taking the time to write a review Debbie. It was a pleasure working with you too and, likewise, look forward to future collaborations. Very helpful & happy to assist with the particular specification of piece. Once we decided on a piece they were able to delivery in our timeframe. Hi Cathy, thank you for the review and for ordering a second perspex artwork, 'burrawang' , this year to add to the 'bellingen' piece that you bought previously. Thank you Matthew and Michael - for the photos too: 'Midtown' and 'Lhotse' work so well in your iconic modern apartment! Hi Pamela, delighted to hear how happy you are with your 'burrawang' artwork that now adorns your dining room. 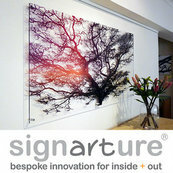 Hope it brings you many years of enjoyment, and thank you again for choosing signarture.